Subtle cues: How does a horse know the difference between collection or backing up cues? Hi Stacy! I have a question I hope you can explain, When asking your horse to give to the bit you apply even pressure to the reins and hold until they give and release. But if you want your horse to back you do the same thing but bump with your legs to go backyards, my question is when your wanting your horse to collect and go forward you do the same with with the reins and bump with your legs. So how does your horse know to go back or forward? 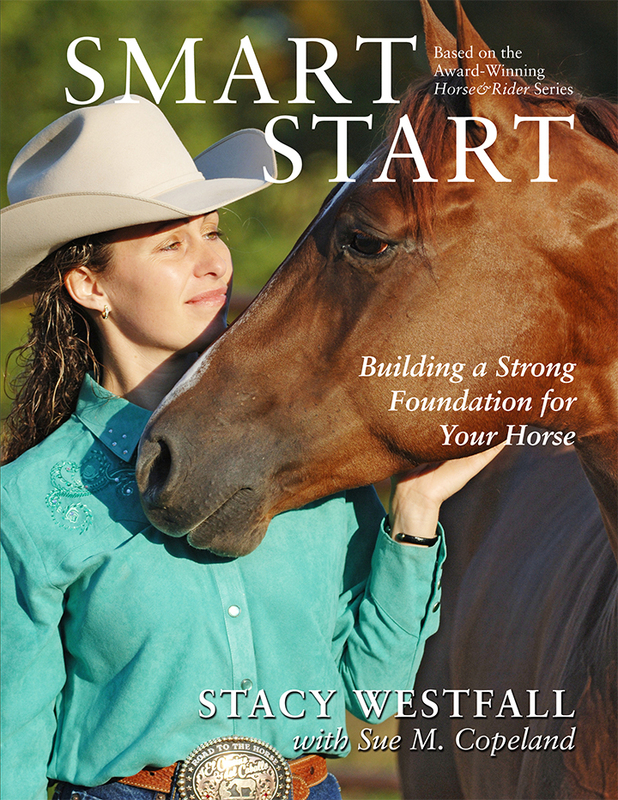 In my book ‘Smart Start’ I explain that in my mind the horses training is similar to our education system; kindergarden, 1st grade, 2nd grade…high school, college, etc. Some of your confusion is coming from ideas that are spread across several ‘grade levels’. If you watch Stacy’s Video Diary: Jac-Episode 21 you will see an example of a horse that is in the 3rd grade. Jac gives to the bit from side to side (see Episode 16) but Jac doesn’t know how to give with his head straight in front of him yet. Collection begins for me when my horses learn to bend and counter bend. (see Basic Body Control DVD) As the horses learn this more complex thought they begin to understand more subtle cues from the rider. My horses understand the difference between similar cues because they are more advanced and understand my system. For example, when I am moving forward and I apply leg and rein this means collect; however if I stop them first it could be either forward or backward. How do they know the difference? If I want to go backward I used my legs in front of the cinch. This is one example. Much like the complexities of our human-spoken languages, horses are able to comprehend multiple requests that have the same end result. Consider how many ways you can ask for a drink of water; spoken request, gesturing, written request, looking longingly at someone else’s drink…you get my point. The biggest issue is rider consistency. To train a horse to read subtle cues requires that the rider is consistent with giving the same cues and the more refined the cue, the more aware the rider needs to be. Roxy was a great example of a horse reading advanced, subtle cues. ← Working with abused horses. My horse who is stlll very young ang figuring things out had trouble sorting this out. He’s getting better now, and he’s even learning whether to stop backing up and moving forward, or stop backing and turn around to go the other way. Lots of slow and accurate repetition is key, I think. I love this! I watched another video that come up after this one. You and Roxy were in Devon 2010. While you were explaining bridless riding & you were going into a canter I think, anyway you said “one kiss means go… Two means go now your in big trouble” I laughed so hard. Off topic- still funny :). when I saw this video for the first time , I only understood what good riding means.i love it! Hi Stacy, For the back, I am being taught much the same way, but also being taught to take weight off my pockets and shift my weight slightly forward freeing up the hind quarters. Do you also do this? Love your Jac videos. I don’t lean forward…but you could. I love how the horses is constantly licking! !